With Diving Log, you can upload your dives to the DAN Diver Safety Guardian website. What is DAN DSG? Log in with your DAN account or create one on www.diversafetyguardian.org. 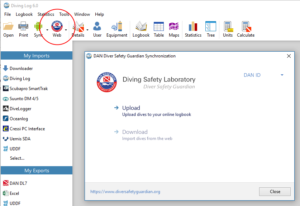 Then you can upload any dive from your logbook to the DAN website.